The Gentleman Crafter: Idea-ology FREAK! Just feeling a bit CRAZY tonight! I mean a true Freakazoid! How in Miss Magonolia's Mangy Mug can I not have any Tim Holtz FOUNDATION FEET!!!!!!! TELL ME! I have at least six of each Idea-olgy piece there was ever made! TELL ME! HOW IS IT POSSIBLE! I'm sitting here with the biggest Belly Laugh (NOT PRETTY! Yes, I can give Santa a run for his MONEY! ) going on because I have TWO Foundation Feet WHEN I NEED FOUR!!!!!!!!!!!! HOW? When in God's Green Gravy did I ever use TWO FOUNDATION FEET and not FOUR! It's simply IMPOSSIBLE! LOL! OK! Calm down Jimbo it's going to be OK!!!! Three deep breaths! I was off to Michaels, Hobby Lobby and Joanns! IS there any? Oh Hellations NO! Four Deep breaths! Hell, give me the oxygen tank! Note to self, write my Congressman to ensure all Tim Holtz Idea-olgy is STOCKED and ready for purchase at these stores! Ahhhhhh! And this is just some of my Idea-ology!!!!!!!!!!!!! Y'all be good and pray for an older balding southern gent in Texas! Appreciate it! Jim - Do you want me to ship you a set tomorrow? Hhahahahaha... oh Jim this just cracked me up, it's something I would do. LOL...you're a very funny man Mr. Jimbo...LOL! I'm sure that that extremely, creative, talented mind of yours can transpose some of that pile of Ideology into some feet...I just know you can!!! you knoooowwww.... you *will* find those other 2 foundation feet weeks from now when you don't need them. :o) But on the other hand... my curiosity is wondering what you are making that will have feet! Well Jim, it appears that your followers are nice than I. My first instinct was to share and as I thought about it I realized that I think I only have one set. I appreciate the story ( sounds like me and looks like my stash sans packaging) and I cant seem to stop buying the stuff. Cant wait to see what you make and what you put the other feet on. Happy crafting! Looks just like my 4'x 8' "Tim" pegboard-I cannot get enough of this stuff.I will probably not sleep well trying to figure out what you did with just 2 feet-at least we all know it was spectacular. Oh, ha, ha, ha. Breeeeeeathhhhhh Jim. Necessity is the mother of invention, right? You will come up with something even better. Keep calm and carry on! Only some of your ideology? Really? No wonder the stores are sold out. Baahahahaha! Nice stash Jim! Sorry No more feet! I look forward to seeing your project though.... Feet or no feet! wow what a hoard of stash you have there - you, er, like ideaology stuff then? Good - you've got it out of your system. Lol. Have you tried writing a letter to Santa? I bet you have it figured out by now. I do have an extra set I can send you if need be. Hang in there. Oh my word, that is surely the most Idea-ology I have ever seen. I think the reason that you can't find any Ideology feet in your region is because the entire stock of Ideology for the regions is residing in your studio. Just sayin'! LOL Jim that is crazy and funny at the same time the one thing you need an all that yummy stuff and not feet oh my. I just love your rants you are so funny. I sure hope you can find some feet. I do have some if you would like me to send them to you. Let me know. How typical is that when you need them. I love your stash...looks like heaven on a table! This is why we love you.....you are human, well as human as a crafter can be. No other person would understand your freaking out like us. Can you take them off something else until you refill your stock? Call Tim, bet he has a few hundred! BAWAHAHAHA! Finally I posted this correctly! Bahahahaha! Thank you again for wanting to help me out! YAHOOOO! Have an awesome Thursday Y'all! Your stash looks like mine. I love all his things. I hate to use it as it hard to replace. I can send you something if you need it. Jim, You are cracking me up. I so wish I could have seen you going through your huge stash of idea-olgy. I love the "How in Miss Magonolia's Mangy Mug" and "off with their feet" quotes. I have this vision of your previous project hiding from you so they don't loose a foot. LOL. Thanks for the laugh. Can you say "Panic Attack"? I'm glad you solved your problem. It made me think of actual furniture... the kind that usually sits against a wall. If you look at more rustic antiques or even furniture today, you will see fancy feet at the front and square legs at the back. In both times it is probably to save money BUT it is also so that the piece can back up against baseboards nicely. A claw-foot leg on a piece would throw it out from the wall way too far. I think I'll remember this myself next time I make one of my altered jewelry/music boxes that I use a thrift store piece to alter. Have a blessed Christmas season Sounds like you could use a blessing or two!! Too funny! I totally have been there. nothing messes up my plan of attack more than when I haven't got something that I THOUGHT that I had! glad you figured out a plan B! You crack me up!!! You have more Idea-ology than any store I've been in! Seriously...I think an intervention is in order...LOL!!! It's no wonder there's never anything left in Gtown! I agree.....can't ever find Tim stuff....now we know its in Granger! Oh sugar just breathe deeply! The dryer elves who eat one of each pair of socks also take one or two of every set of Idealogy feet. I've experienced it myself. Use dice and roll on. Sugar! You had me rolling on the floor with that picture, you look as bad as me, my hubby said with all my "Tim stuff" I need a room just to store that, but you know as well as I that it is terrible to find that you don't have what you need! Glad you found a temporary answer and pray that your shopping produces more. I can see it now Jim, heading to the TH section of each store, grabs all on the pegs and shows up at the check out with 8 - 10 packages of feet. Can you imagine the thoughts going through the check outs brain LOL. Yes, my dear, we are all crazy about our crafting supplies. Thanks for making my day! Haha that is so funny. I was making your Ladies Diary Bed chamber tray on Tuesday - and do you know what i couldn't find - my feet. I was absolutely sure I had a packet, but after I tipped out all my tim baskets - there were none to be found. I think there is a pixie out there hiding our Tim feet! I love the phrases "Miss Magonolia's Mangy Mug " and "When in God's Green Gravy " made me laugh! 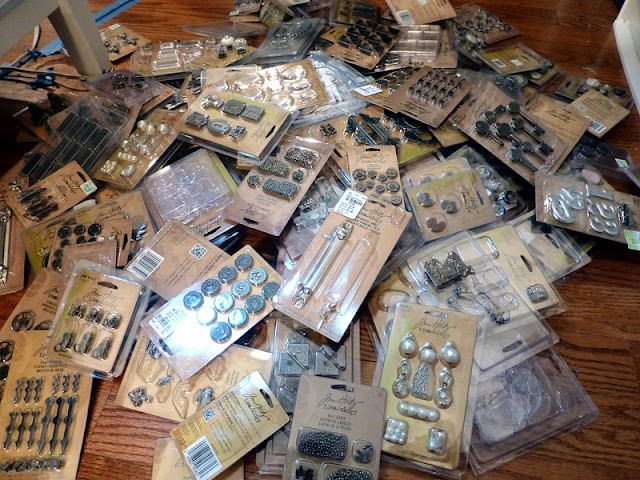 As to your stash....wow, that's a serious addiction (looks at feet and mumbles)...that I am sure no other crafter has!! I have at least 6 sets left over from classes if you want them!!!!!!! You are too funny! Just close your eyes and feel the "calm"... anyway, do I need to meet you in the middle? I saw your stash and forgot to breathe myself!!! :) GASP!.... I have never seen such bounteous glory!!! I Trust you find just what you need soon! You are a hoot and a half. Looks like you are single-handedly keeping Tim H. in business!!! I have all of this going on too, but it all hangs on peg boards in my craft studio...I have 3 packs of feet....I stock up on them anytime I see them on sale....every once in a while, JoAnns will have a 30% or 40% off ALL TH, and I go crazy shopping!!! Good luck Gentle Man....Happy Christmas! !